Well, I've been on a cooking spree again! 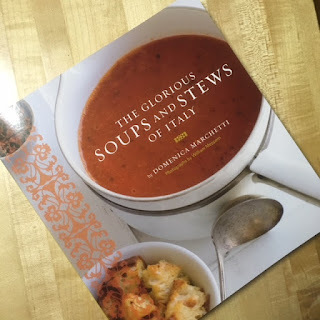 These days, I seem to be addicted to soups and whatnot! It could be due to the cold weather that suddenly fell upon us. No warning ... from gosh it's so nice and warm to Brrrrrrrrr .... I need my winter coat! I think things are settling a bit for me .... 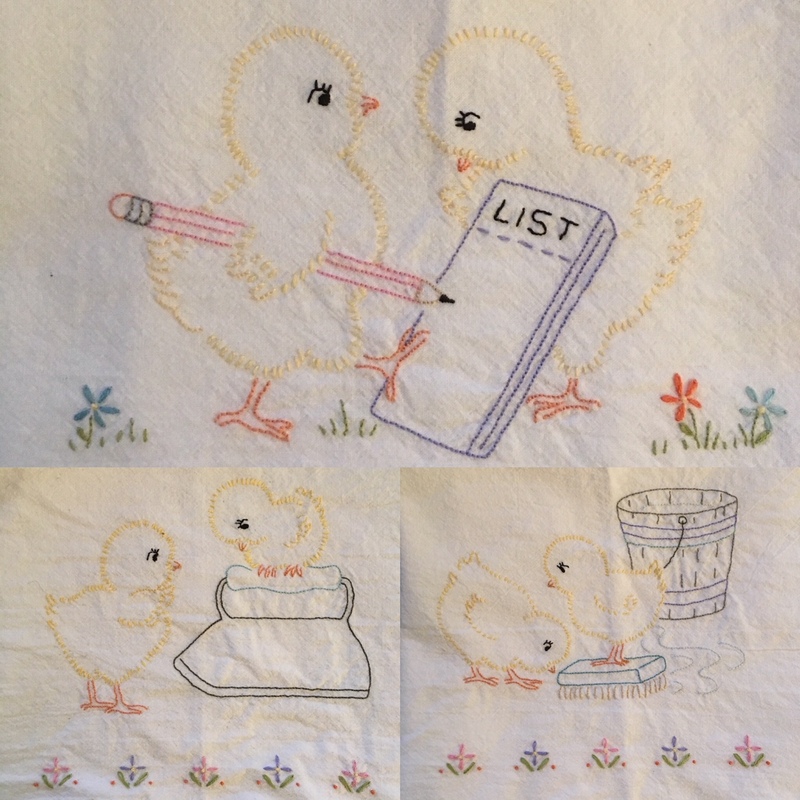 I managed to pick up a needle and do a bit of hand embroidery. 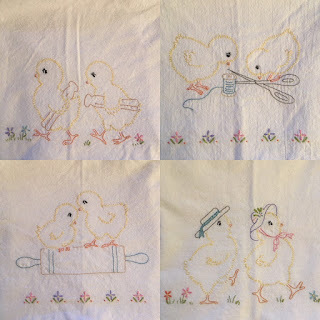 I love to stitch towels ... once the design is stitched, it's a done deal ... no further piecing needed. 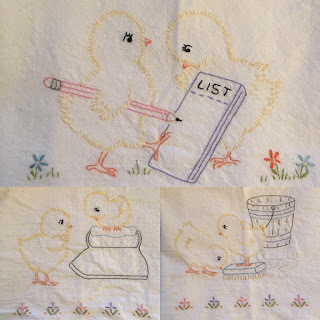 I've been working on the pattern Chick Towels by Yesterday's Charm. Such a cute pattern! Here is the second set of patterns, seven towels in all! 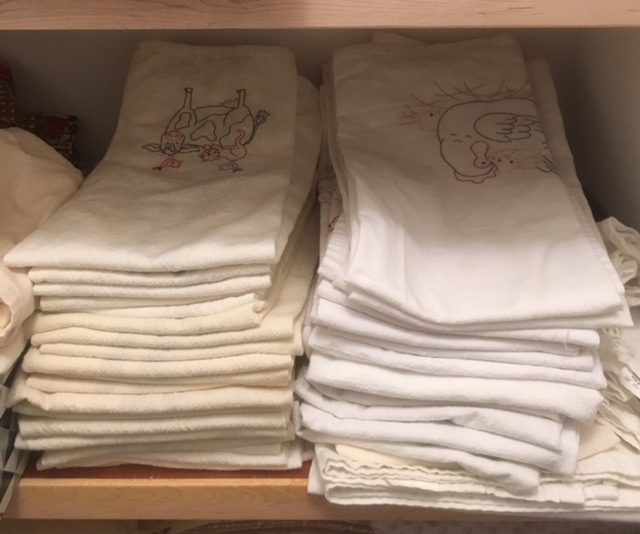 I took an inventory of the towels I presently have. Not included are the numerous ones I have given as gifts! On the right are the flour sack towels (28" x 28") and on the left the smaller towels (18" x 28"). Hum ... I think I have a good supply for now! lol Oh well, Christmas is coming! I'm hoping to actually quilt this week. I FINALLY found the pattern I was looking for ... perhaps motivation to turn my sewing machine on!